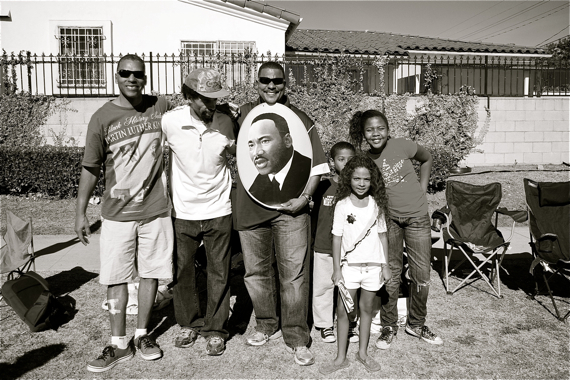 To say change is afoot in the Crenshaw/Leimert area might be the understatement of the year. And, depending on who you ask, you might get very different perspectives on what kind of change you’re looking at. For the elected officials and transit advocates who happily tossed ceremonial shovelfuls of dirt to mark the official groundbreaking of the $2 billion Crenshaw/(but-not-quite-to)LAX Line yesterday, that change is overwhelmingly positive. Officials spoke of the growth in jobs, investment in infrastructure, facilitating mobility for the underserved, easing congestion, and generating long-overdue economic opportunities for and investment in South L.A.
U.S. Transportation Secretary Anthony Foxx even cited Martin Luther King Jr., saying the new line had the potential to free people from an “exile in their own land” by bringing jobs to the area and allowing people to work closer to home. With more time and income on their hands, they could invest more time in themselves, their families, and their communities. This “ladder of opportunity,” he continued, could give them the shot they needed to help them help themselves achieve the American Dream. (Feel free to visit The Source for full coverage of the event and to get your round-up of photos of people tossing ceremonial dirt). That sentiment was one of the things Damien Goodmon and other supporters of the Crenshaw Subway Coalition, who staged a protest nearby, took issue with. They are concerned that the above-ground portion of the rail line — between 48th and 59th — will do “irreparable harm” to the already struggling black-owned business district along Crenshaw. And, they want the American Dream that Foxx was speaking of to materialize much sooner rather than later, in the form of more construction jobs on the line for members of the community. Metro seems disinclined to entertain the demand to put the line completely underground (although a lawsuit on the subject is pending), and the jobs issue is one that they are still working out. The Project Labor Agreement Metro signed two years ago requires that a sizable percentage of workers on any job be hired from within specific pools of “targeted workers.” For locally-funded projects, a minimum of 40% of project hours would have to be worked by local community residents. But, since nearly $546 million of the funding for the Crenshaw Line is from a federal loan, the search for hires must be national. So, while the conditions that 40% of work hours go to disadvantaged workers (those living within economically depressed zip codes or having at least two barriers to entry to the workforce) or apprentices apply to much of South L.A., the workers must be drawn from a national pool. And while, thus far, Metro has been diligent in monitoring the extent to which contractors have been (mostly) compliant with hiring requirements, ensuring that jobs go to targeted workers (or even getting meetings with representatives of contractors Walsh-Shea, according to the Young Black Contractors) is still a challenge (see previous story on question of jobs here). What the wider community thinks about with regard to the new line, however, seems to fall somewhere in between and be punctuated both by a lot of questions and some guarded optimism. 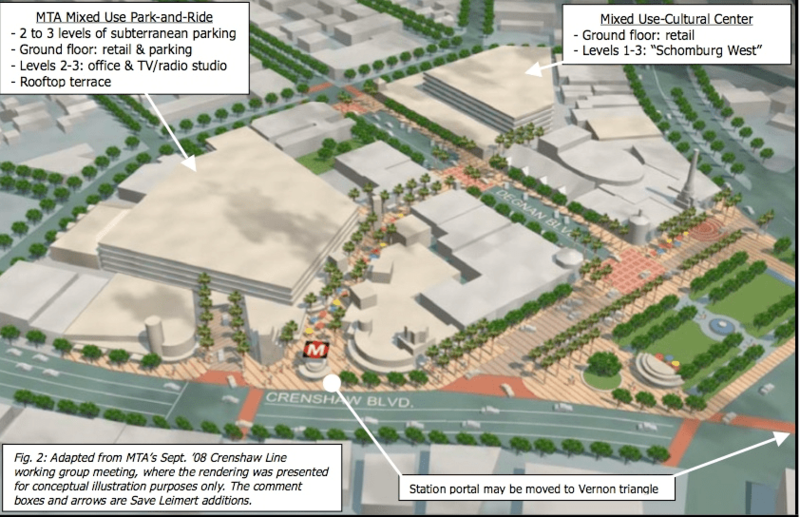 New developments likely made possible by the promise of a transit hub at Exposition and Crenshaw have the potential to bring hundreds of jobs and new patrons to the area. The new District Square development, a 300,000 sq. ft. retail center projected to host Target, Ross, Marshall’s, Burlington Coat Factory, Smart & Final, Chase Bank, Panera Bread, The Coffee Bean, and other shops, could become a significant employer in the area. While it appears that Target is still trying to work out what its obligations to do local hires is, Ron Holley, Development Consultant for The Charles Company (the real estate developer), reassured attendees at the Community Leadership Council Joint Development (POD) Meeting last April that he believed the local hiring goal was 50%, that there will be kiosk space available (for potential use by local entrepreneurs), and that the site could be finished by March of 2015. Such a huge development will undoubtedly transform the area. What is unknown is exactly how that transformation will play out. While some residents and business owners fear that the site could take business from local shops or raise rents in the area, others feel the benefits could spill over to the rest of the corridor. And, although new streetscape plans hint at improvements that could also make the rest of the corridor more attractive to patrons that come to visit District Square, Metro doesn’t have the level of funding it does for the Eastside Access project in Boyle Heights. Which means that improvements will be rolled out piecemeal, at best, and the maintenance of some (like the watering of new trees planted) could fall on the shoulders of area business owners. Moreover, should plans be changed and the train directed underground between 48th and 59th, I was told at a streetscape workshop over the summer, improvements planned for that section of the street would be scaled back. In Leimert Park, local artists, activists, and community stakeholders, not content to await displacement by the gentrification everyone fears is on its way, are looking to harness the change they know is coming. Firm in the belief that the station slated for 43rd Place and Crenshaw — finally approved last spring after a hard-fought battle — was needed to showcase the cultural heart of the black community, they plan to stick around and ensure that that heart keeps beating. Simply being resolved to the task doesn’t necessarily make things easy, however. Some, like those at The World Stage, have struggled to find their footing as rents in the area have gone up in anticipation of the new developments. Even so, others remain optimistic about new opportunities for collaboration and innovation that change may bring, as well as the unique opportunity this moment offers to remind Angelenos of the importance of black history, culture, creativity, and experience to the greater cultural heritage of the city. To that end, the Greater Leimert Park Village Crenshaw Corridor Business Improvement District (GLPVCC) and the Empowerment Congress West Area Neighborhood Development Council (ECWANDC), in partnership with the Leimert Park Stakeholders, have created the Leimert Park Village (LPV) 20|20 Vision Initiative. And, they have asked community members to join them at a design charette this weekend to discuss visions for the future of the area and the role Leimert Park Village can play in the creative industry in years to come. The day-long event will be held at the historic Vision Theatre (3341 W. 43rd Place) on Saturday, January 25 from 8:30 a.m. to 3:00 p.m. Standing outside the KAOS Network (43rd Place and Leimert Park Blvd.) yesterday and discussing the future of the historic Vision Theater and the plans for the building next door (purchased by MacArthur Fellow Mark Bradford and intended to host an art/learning/film space for foster youth, art gallery, and other good things along the lines of a Homeboy Industries model), I couldn’t help but be infected by the optimism of KAOS’ founder, Ben Caldwell. He believes that there is a strength within the African-American community that the city may only be beginning to understand. Artists, and particularly black artists, he says, are usually the first people pushed out when gentrification comes to town. If stakeholders, business owners, and artists can find a way to forge a vision and a path forward together, this time just might be different. If you’d like to learn more about the objectives of the planned charrette, please click here. In preparation for the charrette, organizers have asked participants and stakeholders to take a survey by the end of today. This is such a loaded post. You can’t denigrate transit and economic improvements and the actors involved in making them happen while demanding that they happen at the same time. That’s just a lazy, outdated tactic. White people and architects aren’t evil. And underground construction costs a hell of a lot more money than surface construction. And there really isn’t anywhere that light rail hasn’t economically improved the area through which it runs. Moreover, not everyone in gentrifying neighborhoods fears that kind of change. I’ve known plenty of people in similar neighborhoods who’ve told me how happy they were finally be able stay in their own areas rather than have to travel across town to run errands and access services that didn’t exist where they lived before development finally stopped ignoring their communities. You seem too want to have it both ways. And you actually can. But definitely not by demonizing the process or your fellow stakeholders in it. That’s actually the best way to get shut out of the process, anywhere. That’s silly… Nobody is denigrating transit and economic improvements. I think it is probably fair to say that most people are genuinely hopeful that the Crenshaw Line will bring all the investment, jobs, and other positive things that authorities are promising. What they are concerned about is how that will affect them and their ability to stay in their neighborhoods. Black construction workers have had a very hard time breaking into the profession and making a career out of it, and it is frustrating that, even with a PLA in place, they don’t seem to be getting the jobs on the line now. Similarly. developments/investment that have come into lower-income or underserved areas have generally not oriented in such a way as to assist existing entrepreneurs to adapt. For those in Leimert who are already feeling a crunch with regard to rent, the future seems uncertain. That’s all people are concerned about — that they have a say in the way their neighborhood changes and that the development doesn’t come into the area in a way that seems tailored to edge them out.